WILL THERE EVER BE MOD SUPPORT? There’s a bunch of mods already out there for the game, see here and here. 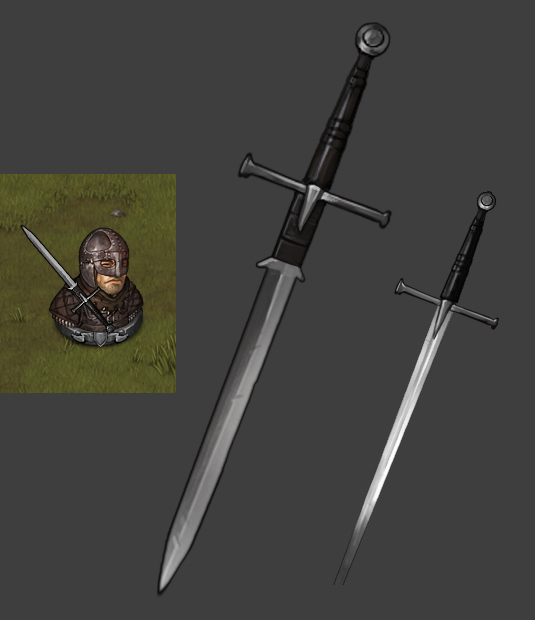 Although we would have liked to support modding beyond what is currently possible, early on in the development of Battle Brothers we had to make tough decisions to get the game made at all. These decisions can’t be undone anymore, and that’s just the way it is. If there is ever going to be a Battle Brothers 2, it’ll have full-fledged mod support for sure. Are you planning to add a sharpen wood for the barbarian as one of thrall’s basic weapon? I’m picturing something similar to the orc’s javelin. Aaaand those new armors look so great, they already make me feel saaalveeege! I like the first one more. Corinth full helmet with long wick horn widely growed totally fit into the BB lore as a fashion from the legacy of the ancient empire! Would be great if I can have one of those cover some bros head!! Even it would poke the other bros who stand beside him. Feeed us, Paul, fiilll our hunger!!! Check this out, Krumhorn asked me to clear this camp, and it would be a trip about at least 2 days and half. And don’t mention those quests given by noble houses, had to cross the map from east to west and then travel all way back, with so many mountains in between, while the whole world was waiting for my “salvation”. Thanks Ledgren, its good to know that I could run, never thought that before. Next time I clear a camp with extra leader, I will set the formation to minimum to get away fast. I mean, the fact that you finished one mission, the tutorial, and then refused both one and two skull quests that could have helped you get money and experience says quite a lot. Three skull missions are designed to either be unbeatable, a fight you should walk away from, or very difficult, a fight that will cost you a few mercenaries. Doesn’t mean they always play out that way. It does mean you shouldn’t be bee lining straight to them if you intend to get unhappy about losses. As for world-map enemies, running away from a lot of fights is very important until mid to late game. Am i reading this right, BB is one of your all time favourite games but you gave it a negative steam review? Why not go positive and then add a cautionary note to those that aren’t prepared to sink enough time to learn how to prosper in ironman? …meant to quote your other post dude sorry! I have played this game for 1110 hrs on steam’s record, but I don’t think it’s wrong that someone left a negative review for it even he/she mostly like the game. A game deserves both positive and negative reviews from its players. And sometimes, the more you love it, the more disappointment you will get from it. it’s clearly a renaissance design and would only exist in the 16th century which is 200-300 years later. Feel the same here. But guess the coming dlc have changed the theme, for example the fencing sword. But anyway, the vanilla game also have something maybe not very pre-renaissance, such as the hat those greatsword soldiers from noble house are wearing, and the hat for witch hunters. WOW! I like it! But I also like the old one a lot. The old one looks like the one I saw in GOT, and it’s classsiiic! The player’s mercenary band do lack of diversity, but tucking extra skills won’t change it. At day 200+ you will still get the very similar band like your any other play though, just with one or two extra skills, which makes your band even stronger. What really in need of diversity is the arrangement of equipment and other resource. The armor and weapon your great sword guy was using on day 150 won’t change much on the day 250. Thank you for your reply Rap. And sorry ForceEcho, I was kinda trolling, my apology. It would be nice if the shield breaking weapons could do more duration damage on shield using standard attack. And 100% hit chance for shield breaking skill is unfair. but if he enter the battle with fail and shield while, during the battle he switch them to his bow, after battle, his weapon will be reset.